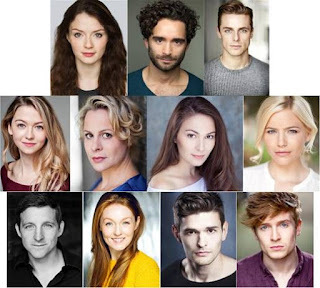 A stellar line-up of leading musical theatre artists are taking to the stage of The Hippodrome in London’s West End on Sunday 4th March for an evening of songs by award-winning composer and lyricist Alexander S. Bermange. London’s Leading Luvvies Perform Alexander S. Bermange boasts a stellar cast including Christina Bennington (currently Raven in Bat Out Of Hell), Matthew Croke (currently Aladdin in Aladdin), Daniel Hope (recently Michael Wormwood in Matilda), Charlotte Kennedy (currently Cosette in Les Misérables), Rebecca Lock (recently Winifred Banks in Mary Poppins), Suzie Mathers (recently Glinda in Wicked), Kelly Mathieson (currently Christine in The Phantom of the Opera), Haydn Oakley (currently Henri Baurel in An American In Paris), Lucy O’Byrne (currently Maria in The Sound Of Music), Benjamin Purkiss (currently alternate Strat in Bat Out Of Hell) and Patrick Sullivan (currently Blake in Bat Out Of Hell) (Please note that all the cast will perform subject to availability). Alexander S. Bermange has acquired a formidable following amongst millions of radio listeners through his many appearances performing his comic songs on BBC Radio 4 and the BBC World Service. His further writing credits include musicals and theatre productions that have been produced in London, around the UK and internationally; and a new musical revue that he has created (entitled I Wish My Life Were Like A Musical) will be running at the Crazy Coqs at Zedel in the West End later in the spring. Alexander recently topped iTunes’s comedy album chart with Wit & Whimsy, a new album celebrating his work and featuring 23 popular personalities and West End stars, many of whom joined him at The Hippodrome for a sell-out event in April 2017. The starry selection of artists joining Alexander for his brand new show at The Hippodrome are giving their debut performances of Alexander’s latest and greatest work. Of the comedic musical creations on offer, some are topical treats inspired by whoever and whatever is currently hitting the headlines, others conjure up a colourful collection of crazy characters, and others take a humorous look at the absurdities and adversities of 21st century life. These are complemented by performances of songs of a more serious nature that promise to touch the heart and send shivers down the spine. London’s Leading Luvvies Perform Alexander S. Bermange is at The Hippodrome on Sunday 4th March at 7.30pm. For further information and tickets, please call 0207 769 8888 or visit http://bit.ly/2h43ctu.